Grains are currently public enemy number one, until that is reports of grain free diets causing heart failure came to light! So are there actually any healthy grains for dogs or are they all as bad (or good) as each other? 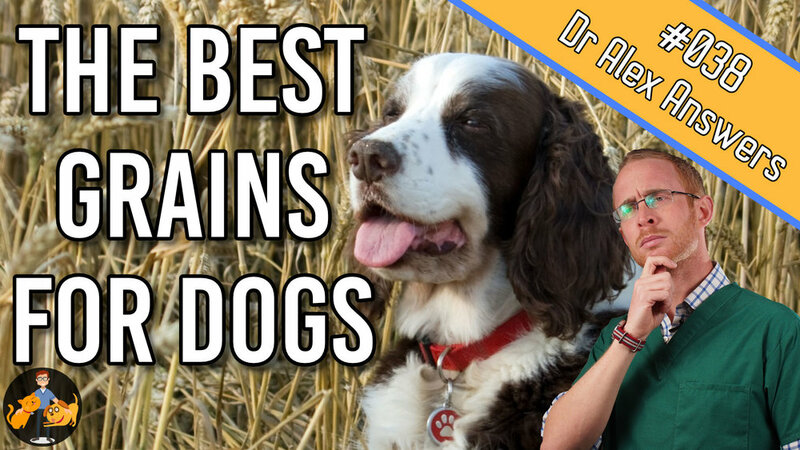 My next question is from Carla who asks: “With the implication of grain free and exotic ingredients in a dog's diet, what grains are considered to be beneficial and the healthiest for a dog"? She knows that corn and wheat are not at the top of anyone's list, but what grains should she be thinking about feeding her dog? So to start with, for those of you who aren't aware, grain free diets have been implicated as a cause of heart failure in dog breeds that would not normally get that particular type of heart failure. It's not just grain free diets, it's also boutique food brands and exotic ingredient diets and that includes raw diets that have been implicated in this. We don't know what the cause is. It’s not taurine, which is something that's been talked about and a deficiency of which is known to cause heart failure in cats. An investigation is ongoing, so hopefully we'll have an answer about that soon. If you want to know more then here is my article: Is grain free dog food killing our pets? So let's start with the fact that dogs have no absolute requirement for carbohydrates, meaning that they don't have to have carbohydrates in their diet, but they have evolved to be able to digest and to make use of them. So they have different genetics to wolves and they are able to digest grains and they are able to utilize them in their diet. Again, I have spoken about this in more detail in my review of raw diets vs kibble. Seeds from different grasses, and they include things like barley, rye, spelt and wheat. We get gluten free varieties, corn, oats and rice. Pseudo grains are seeds from shrubs and other plants and that's things like buckwheat, millet and quinoa. So grains really, what are they? Well, they're the seeds like I've said, but they are actually complex carbohydrates made up from starch and fiber. So that's really what makes them up. If we think about refined grains, so things that have been heavily processed, then they really only include something called the endosperm, which is simple starch and proteins. Bran, which is the really fiber rich outer layer of the grain. It's good for intestinal health and the bran is also rich in vitamin B and other minerals. The central germ that contains vitamin E, the B vitamins, antioxidants and some fats as well. So whole grains really, they're much more nutritious than highly refined grains, which probably won't come as any surprise to you. Also what grains are healthy to feed to a dog? So having said that dogs can digest grains and they can utilize them, grain shouldn't be utilized as a substitute for high quality animal protein. So we're not talking about using grains to completely replace the animal protein or the meat, if you like. We're just using it as an addition to a diet. Now, some dogs are allergic to specific individual grains, so not all grains, and wheat is actually the most common type of grain allergy that dogs have. But the risk of this is greatly overstated and it's definitely not the most normal reason for food allergies. By far and away the most common food allergies that dogs experience are to the actual animal proteins. So that's things like beef, chicken and dairy, which are the top three causes of dietary allergies. Wheat then comes next. Some dogs do have a gluten sensitivity. It’s generally breed related, genetic related. Irish Setters are the most likely to have this, but again, it's not really common. In the vast majority of dogs, grains can be a valuable source of nutrients without causing any harm to health. Whole grains are generally more nutrient rich. So rather than talking about which grain in particular, I'd be saying whole grains are definitely the best, and that’s something we should be thinking about. They're more nutrient rich than highly refined grains. That said, they shouldn't make up the bulk of a diet. The reason this is an issue, is that refined grains especially, they are very cheap and so they’re often used as the main bulk of a diet, especially in cheaper diets. So, we want to be thinking how much grain is in a diet. We don't want it to be the main ingredient, and also what type of grain? So, rather than the specific plant, we should be thinking about whole grains rather than refined grains ideally.